On Sept. 5, 1986, Pat Girtz was hit by a drunk driver and sustained life-altering injuries. Thirty-seven years ago, Wayne Terry made a decision that would impact his life, too, but in a much different way. On June 2 at the Hotel HL in Olympia, they’ll sit on the dais together to be inducted into the Washington Chapter of the National Wrestling Hall of Fame. “I’m very humbled that they’d even consider me,” said Gertz, who is receiving the Medal of Courage. 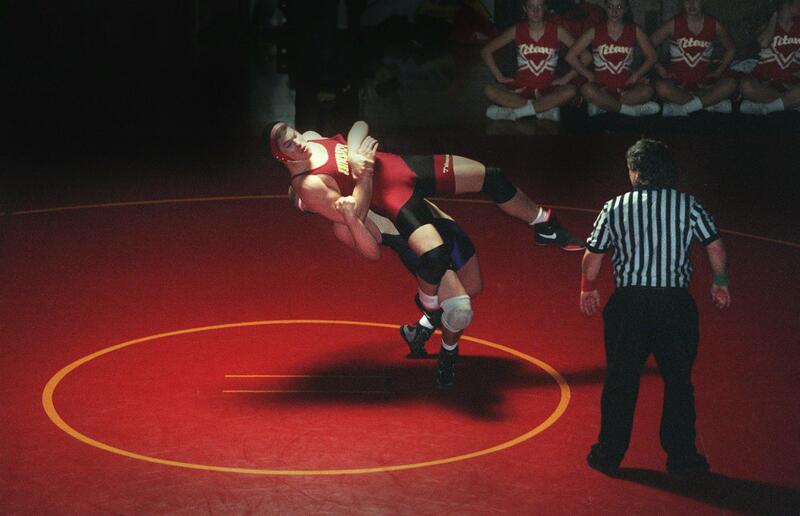 He has been a registered wrestling official for 49 years and was a state-level official at the time of the accident. “That set me back several years,” he said, forcing him to do less-stressful, lower-caliber matches. But he stuck with it. He’s the current president of the Inland Empire Wrestling Officials Association and is one of its lead trainers. This year he received his 23rd assignment to Mat Classic. He hasn’t disconnected himself from the accident. Twice a month he speaks to the DUI Victims Panel, which has drawn up to 100 people at its meetings, and he also regularly speaks on the subject at local schools. Terry, whose involvement in wrestling goes back to when he competed at Medical Lake High School, will be inducted into the Lifetime Service to Wrestling category. “Pretty amazing,” he said of the honor. Which also describes the accomplishment. Terry was involved in starting a club program in his hometown. “We started with 17 boys,” he said, and looking for someone to wrestle besides themselves. “The next year, Chewelah started a program, and the next year Colville started one,” he said. In five years, there were five clubs in the area with 150 boys. This year there will be 97 teams in the Washington Little Guys Wrestling League in four states – from Cle Elum and Okanogan in Washington, to Sandpoint, St. Maries and Orofino in Idaho and Hermiston in Oregon – that surround the Spokane area. Last year the program had 4,086 kids. They’re still registering for 2019. With new programs added, the number likely will go up. Terry’s involvement goes beyond the kids. He was venue chairman for the 1996 Olympic Trials and 1999 World Cup of Wrestling Finals held in Spokane and he was a torch bearer when the torch for the 2002 Salt Lake City Winter Olympic Games passed through Spokane. They are the seventh and eighth men from the Spokane area whose names will be permanently enshrined at the National Wrestling Hall of Fame and Museum in Stillwater, Oklahoma. Mahmood Sheikh, who earned bachelor’s and master’s degrees from the University of Idaho and spent six years working in the athletic department in various development positions from 2003-08, is returning to the Vandals for a second stint in the department. The Moscow native will be Idaho’s associate athletic director for development. He will oversee the Vandal Scholarship Fund and be responsible for procuring major gifts for capital projects. He will be positioned in Boise. Sheikh’s last position at Idaho was as an assistant athletic director and executive director of the VSF. He went to Colorado, where he spent three years as an assistant A.D. and Buff Club director before leaving college athletics. Sheikh recently spent more than nine years as the deputy executive director for the Idaho State Bar and Idaho Law Foundation Inc. Led by Gonzaga senior Sophie Whittle, who is ranked No. 1, five area women are in the latest Intercollegiate Tennis Association’s Top 125 rankings, including Whittle’s junior teammate, Domonique Garley, who is No. 111. Washington State has three on the list – sophomore Michaela Bayerlova, who climbed 20 spots to No. 63; and senior Tiffany Mylonas and junior Melisa Ates, who are tied at 115. • Breanna Stewart, the WNBA regular-season and finals MVP, who led the Seattle Storm to the WNBA championship, was named the Female Sports Star of the Year at the 84th MTR Western Sports Star of the Year banquet last week in Seattle in which Washington State soccer standout Morgan Weaver was a finalist. • Cole Olsen, a Lewis-Clark State sophomore from Clearwater, Idaho, was named the Frontier Conference Men’s Indoor Track Athlete of the Week last week after he finished first in the 5,000 meters at the WSU Invite with an NAIA-qualifying time of 15 minutes, 11.85 seconds. • Jake Albright, a Walla Walla Community College sophomore center from Clarkston, scored 51 points on 70 percent shooting, and averaged 10.5 rebounds, 4.5 assists and 3.5 blocked shots in two Warriors victories to be named NWAC Men’s Basketball Player of the Week. • Tyrus Hosley, a Northwest Christian junior who transferred from North Idaho as a sophomore, was the Cascade Collegiate Conference Men’s Basketball Player of the Week. The point guard scored a career-high 29 points with seven assists and five rebounds one night and the next night led a Beacons comeback from a 17-point deficit with 10 of his 12 points in the final five minutes. • Three Greater Spokane League graduates are among five area athletes named to the Great Northwest Athletic Conference women’s basketball all-academic team with GPAs of 3.20 or better. Two of the recipients, Saint Martin’s Emma Kennedy, a senior from University, and Mallory Kessler, a senior from Ritzville, were honored for a third straight year. The others – Tayler Drynan, a Simon Fraser junior from Gonzaga Prep; Taylor Cunningham, a Montana State Billings junior from Lewis and Clark; and Erin Higbie, a Concordia (Portland) senior from West Valley – all collected their second straight awards. • Twelve athletes with area ties were named to the Frontier Conference Academic All-Conference Football Team with GPAs of 3.0 or higher. Carroll: Dustin McLean, so., Lewiston; Drew Melton, sr., Lewiston; Sam Stratton, jr., Shadle Park. College of Idaho: Josh Brown, sr., Colfax. Montana Tech: Thomas Anselmo, so., Priest River; Tanner Chase, so., University; Kellen Davis, sr., Moscow; Paul Sundquist, so., Sandpoint. Rocky Mountain: Brad Drake, sr., Priest River; Tyler Eberhardt, sr., Lewiston; Joel Kaplan, so., Ferris; Tom Roman, sr., Post Falls. • Defending West Coast Conference baseball champion Gonzaga has been picked to repeat in the coaches’ preseason poll and two Bulldogs, sophomore infielder Ernie Yake and junior right-handed pitcher Casey Legumina, were named to the Preseason All-WCC team. • Whitworth returns All-Northwest Conference honorable mention third baseman Tyler Bailey (Mt. Spokane) as the Pirates try to improve on the NWC coaches’ preseason baseball poll that ranks them fifth. They were sixth last season. George Fox bested Willamette atop the poll. • Despite having two All-Northwest Conference players – infielders Michelle Silva (first team) and Sara Gayer (third) – returning to lead a veteran team, Whitworth was selected to finish fourth in the NWC preseason softball coaches’ poll. Defending co-champions Linfield and George Fox were picked 1-2 with Pacific third. Jasmine Fryer from West Valley and Brelane Huber from Post Falls, both two-time state qualifiers, have top-15 ratings in the third National Girls High School wrestling rankings for the 2018-19 season. Fryer, a senior and two-time Mat Classic 2A placer, climbed into the national rankings put out by the National Wrestling Hall of Fame, USA Wrestling and FloWrestling at No. 15 at 225 pounds. She had not been ranked. Fryer finished second at 235 pounds at Mat Classic in 2018. Huber, a junior who won the 106-pound women’s freestyle finals at the 2017 USA Wrestling Cadet Nationals, is ranked eighth nationally at 112 pounds. She was sixth in the previous poll. Goaltender Reece Klassen, acquired by the Spokane Chiefs from the Lethbridge Hurricanes on Jan. 2, was named the Western Hockey League Goaltender of the Week for the week ending Feb. 3 after collecting his first WHL career shutout. The 19-year-old from Cloverdale, British Columbia, who has played in 54 WHL regular-season games, stopped all 25 Kelowna shots in a 4-0 Spokane victory on Feb. 1. He followed the next night with nine saves on 10 shots in 25 minutes of backup duty in an overtime loss at Portland. Eastern Oregon football: Ben Cunningham, OL/DL, Clarkston, two-way All-GNL first team. Former Gonzaga goalie Ben Willis, who completed his college career with the Bulldogs in 2018, signed his first professional contract to play with Rio Grande Valley FC in the United Soccer League. The Edinburg, Texas-based team plays in the USL’s 17-team Western Conference that also includes the Seattle Sounders FC 2, against whom the Toros open their season March 8 in Tacoma. Willis, All-West Coast Conference honorable mention in 2018, started 17 games and led the WCC with 77 saves and ranked second with 4.53 saves per game. He had two shutouts, giving him nine for his career, which ranks fifth all time at Gonzaga. Submissions received after 5 p.m. on March 14 will be included in the online directory, but not guaranteed for the print version. Published: Feb. 9, 2019, 5:42 p.m. Updated: Feb. 9, 2019, 10:07 p.m.